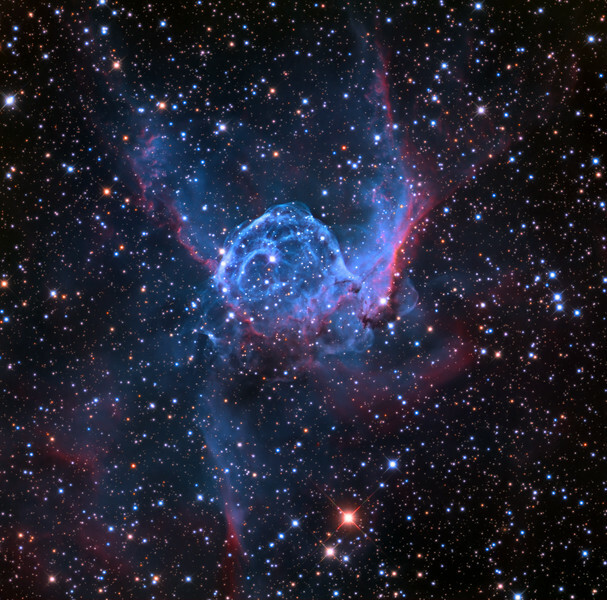 NGC 2359, Thor's Helmet full view, cosmic bubble emission and complex nebula. 32 inch Schulman telescope with STX camera on Mt. Lemmon, AZ. Data capture and reduction by Adam Block, University of Arizona. LRGB processing by JDS using CCDStack, Photoshop CC, and Noise Ninja. Compare this image from data obtained in 2015 using the 32 inch telescope at about 9,000 feet altitude on Mt. Lemmon, AZ with the following image created from data obtained in 2006 using a smaller telescope at 500 feet altitude in Palm Springs, CA.